The party continues. If you have missed our earlier party posts then you need to start from our first April post - we've put together a bunch of party posts JUST FOR YOU ! Dear readers, by now you probably know my(Deepa's) love for entertaining! 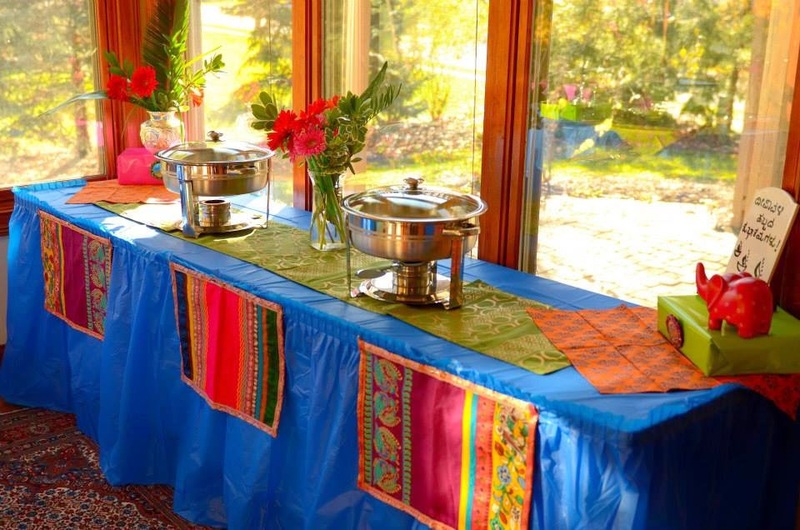 I love to create an experience for my guests be it a homespun feast or a catered extravaganza. It is something I truly enjoy. My home and my dinner table often serve as a canvas to create a memorable experience for my guests. Yes, I am a fine china and hand cut crystal kind of girl! Hope you've have enjoyed our feature posts on the fine art of entertaining incorporating festive tablescapes and elegant ambience and tonight I bring you the final stop in this series. 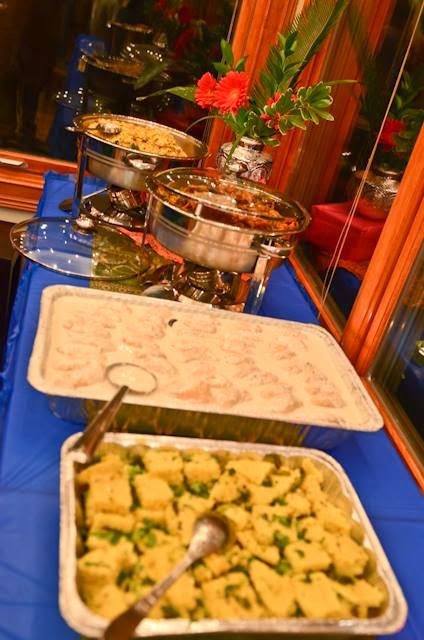 I'll show you how to set a mean Desi buffet - effortlessly! That's right! I'll let the pictures speak for themselves this time but do not hesitate to ask questions and I will be happy to answer any. 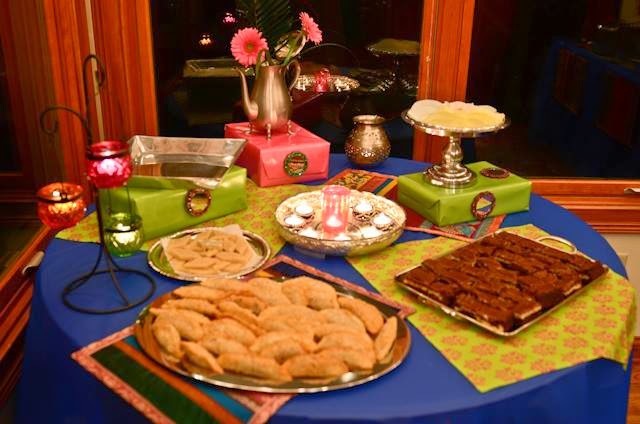 These pictures are from my Diwali buffet last year but the ideas would work just as well for any other ethnic celebration. First, a big thank you to all my lovely friends who pitched in with the food for this celebration. I just served it up with all the fixings! 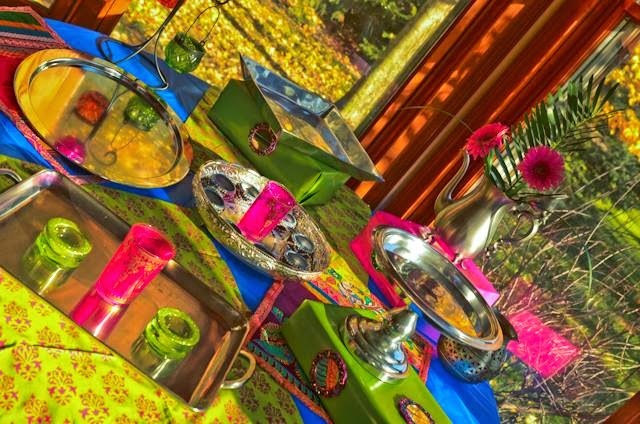 I managed to bring India into my buffet via the use of striking colors, bold patterns and touches of silver. This seasonal spread called for lights, after all it was Diwali and so I added lots of lights - globe lights, moroccan lanterns, tea lights and more! 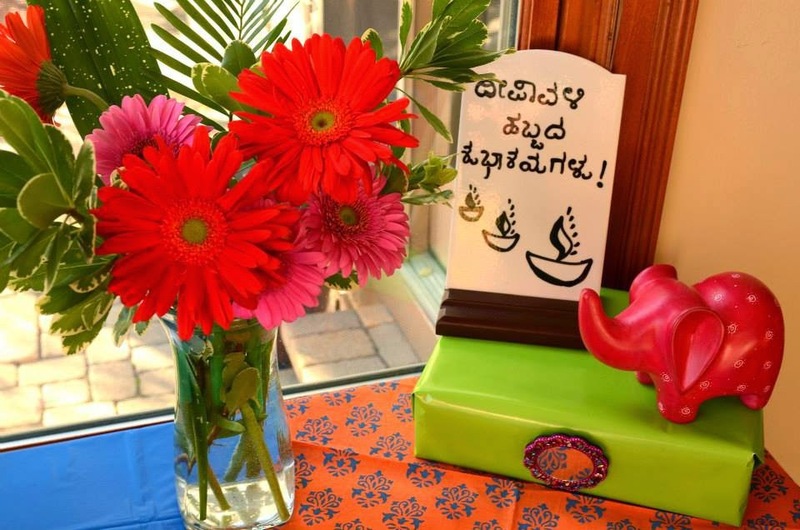 Other elements of note in this buffet include the hand written kannada Diwali greeting and the goody bag tags. The hand written sign was not only an ingenious way to infuse warmth but also a great way to create a sense of cultural cohesion and oneness . 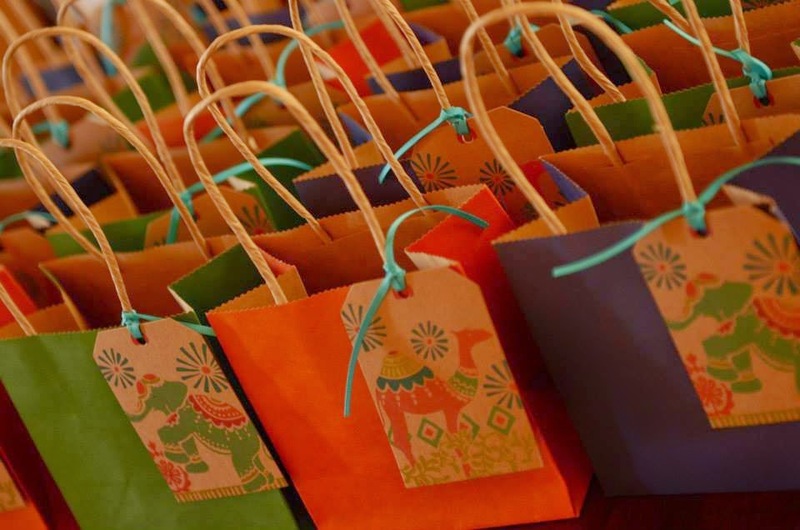 Now for the goody bag tags, my go to source is World Market and they usually carry a variety of tags with an Eastern flair and mine were perfect with the firework detail. 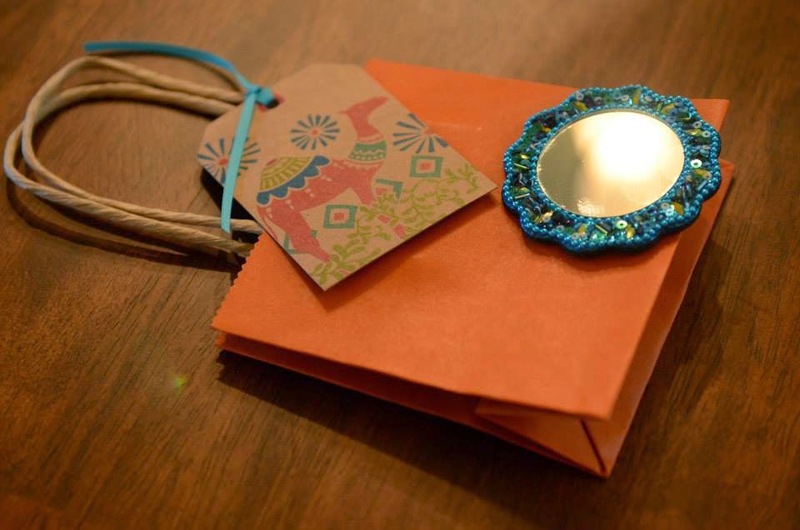 The tags were a great way to transform an otherwise plain and functional goody bag into something special. Remember, if time was not an issue, this is a great DIY party element. Another thing at play here is mix of elements - remember , everything does not have to match always. 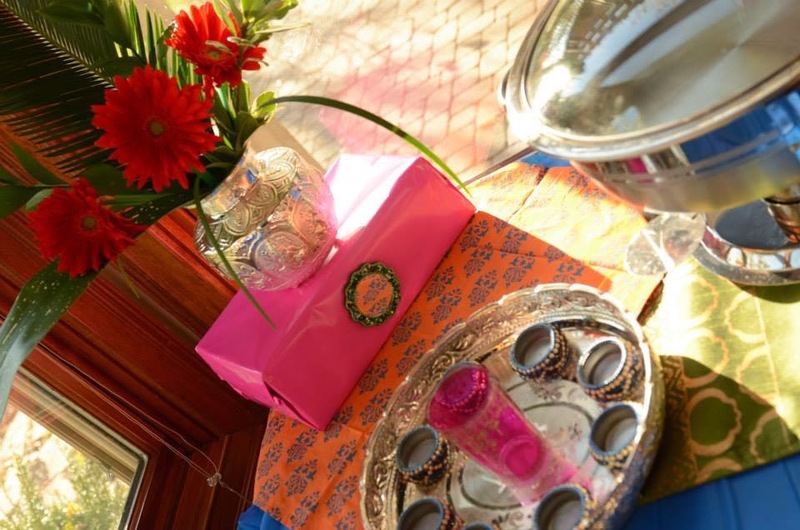 I have paired my Varnanggall place mats with my Pier one Moroccan mats and used an eclectic mix of tea light holders. Mixing elements together keeps the eye moving and creates texture and interest and this applies to colors as well . Now, the dessert table! Allow your guests to take delight in the gorgeous display of mouth watering sweet treats. After all, the fine of art of entertaining calls for a stimulation of the senses - visual, tactile, gustatory and olfactory! In this case, I have created a dessert display of varying heights using gift boxes as risers (simple DIY that!). Some alternatives could be stacked books or wooden stands. The idea is to add some depth and dimension to your display. Now if this was a western dessert bar, I would probably turn to apothecary jars, cake stands, tiered cupcake holders, glass compotes and such. The buffet style dinner takes some planning and effort, no doubt but it is a great alternative for a larger crowd and allows your guests to mingle and interact but like everything else the Devil is in the details! If you share this esoteric interest of hosting elegant dinners, then write to us-tell us about your own parties and your go to resources - WE LOVE TO HEAR FROM YOU! 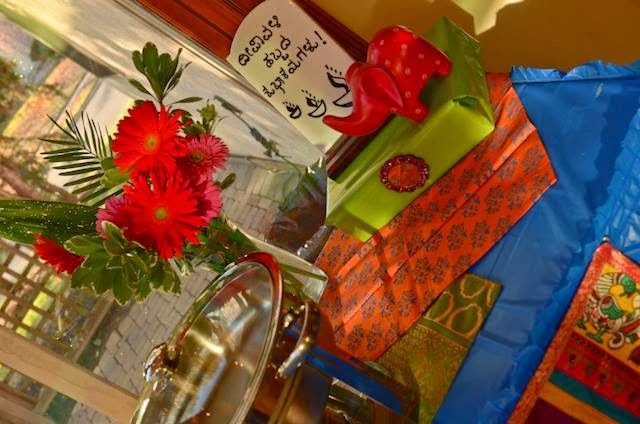 Athithi Devo Bhava - May your guest be your God- says the Taittirya Upanishad and that is truly our guiding principle of hospitality. Combine that with the western way of entertaining and you can have a lot of fun! So, pencil in a buffet style dinner in your social calendar and have fun putting it together! Now, here are a few hints from our May line-up - kantha, artist feature, New York and maybe (keeping our fingers crossed), a home tour (not necessarily in that order either). So, join us right here on Aalayam for more lifestyle inspirations! P.S: All images are from my home and may not be used without permission. Credits: my husband. Oh thank you Sruthi! 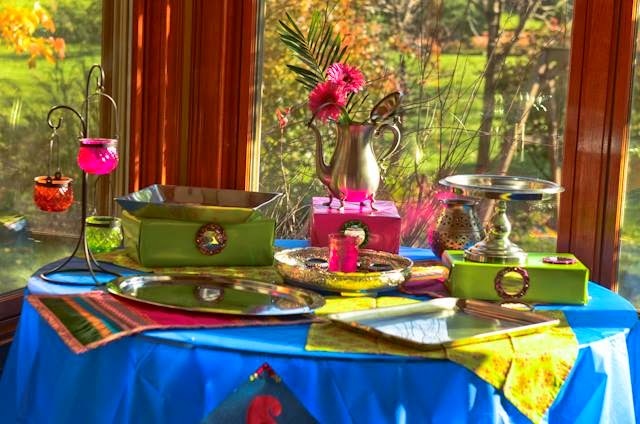 Of course, the colors are quintessential and I was working with what I already owned- the gorgeous Varnanggalla placemats! Oh sure, you are welcome anytime. how about a road trip to the midwest this summer? I love hosting parties. I have grown up watching my mother host lovely parties for friends and family and will gladly do so in a heartbeat but.... the desis I meet are such kill joys!!!! 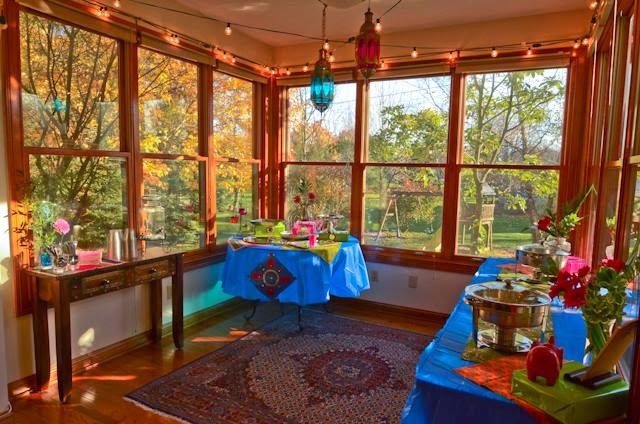 Still I am super excited about a Middle Eastern party I am going to host next month. Loved your entire April spread. I love your blog girls. Your content is always of a high standard. Kudos. :) Where do you live Ashwini? And I would love to hear about your middle eastern party- maybe we can showcase it on Aalayam- take some pictures for us! And thank you very much- like I said, I love entertaining or rather the process of it and over the years, I have a party closet - stemware, plates, silverware etc and it's so much fun to mix and match and put things together. Thank you for your kind words about Aalayam too - supriya and I find it very humbling to receive such heart warming comments. We share what we both are truly passionate about and to have created this li'l community of like minded inviduals, to see it grow and share ideas has been a great joy! What an absolutely lovely party decor! I love the way the mats were played around to mix and match all around. Deepa...simply phenomenal!!! Koi aap se seekhe mehemaan ke dhek bhaal kaisie karthe hai!!!! Wah!!! Lahjawaab!!! thanks for reading and your support to us and Aalayam.